1. 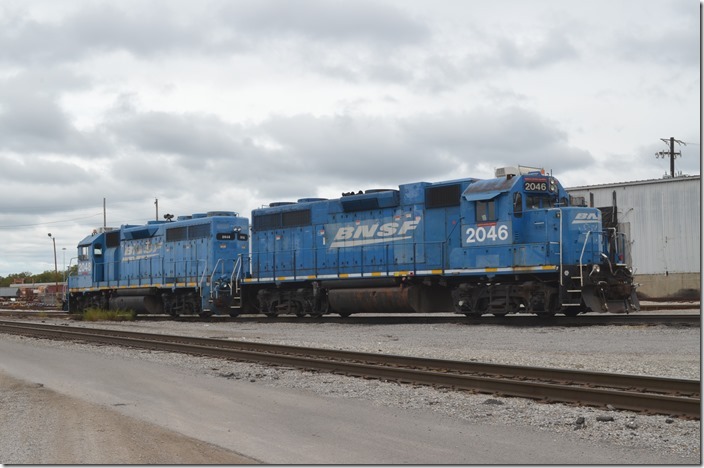 BNSF GP38-2s 2046-2048 at East Thomas Yard AL. This is the former SL&SF (Frisco) yard. 2. 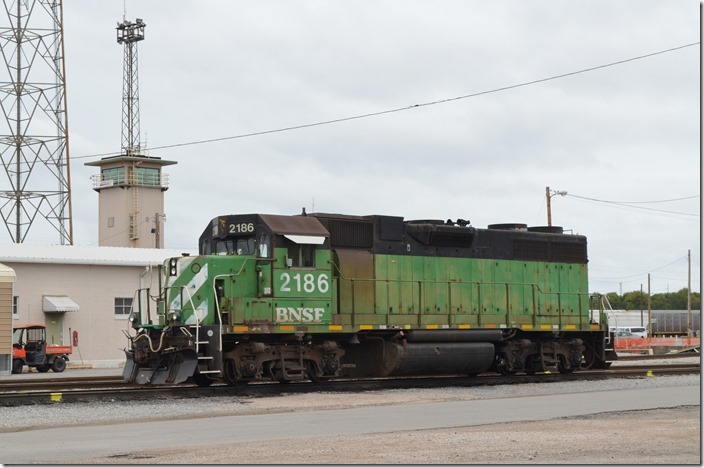 BNSF GP38 2186 is ex-BN. nee-Penn Central. E ThomasYard AL. 3. NS 3201-6171-5833-3332 head s/b A5T-04 (B’ham-Tuscaloosa or Boligee AL) with 81 loads and 29 empties. Had cars for the Alabama & Gulf Coast Ry. at Boligee, plus other local freight. Bessemer AL. 4. 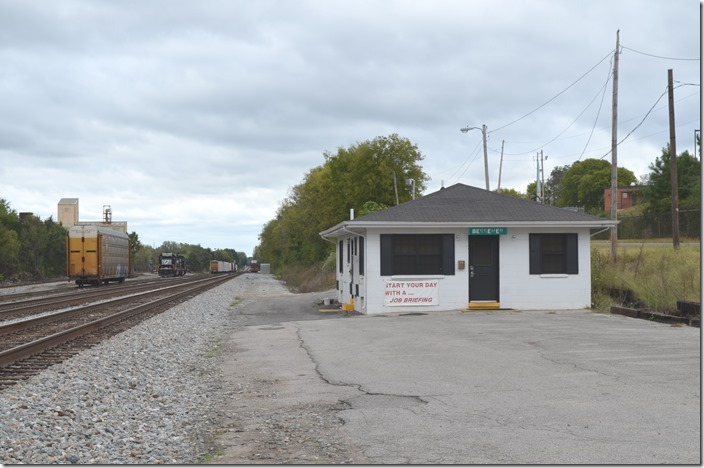 Southern Ry depot Bessemer AL. 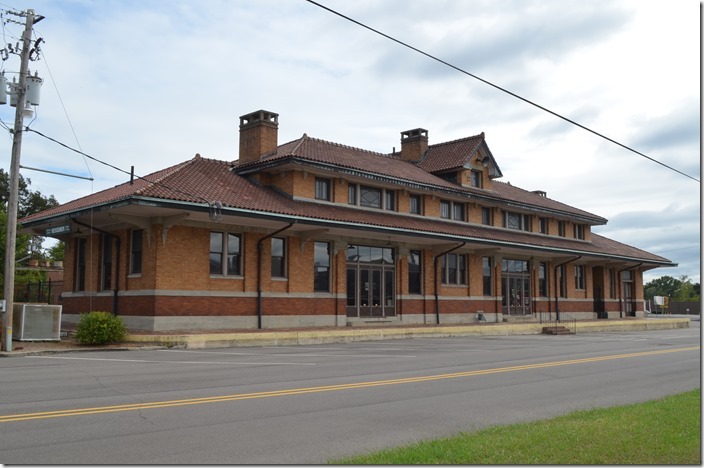 Restoration of the Bessemer depot into the Hall of History. Plaque. 5. Bessemer Hall of History. View 2. 6. Bessemer Hall of History. View 3. 7. NS 9226-9194-2708 head s/b freight 385-04 (Birmingham-Mobile) with 31 loads and 28 empties. Bessemer AL. 8. 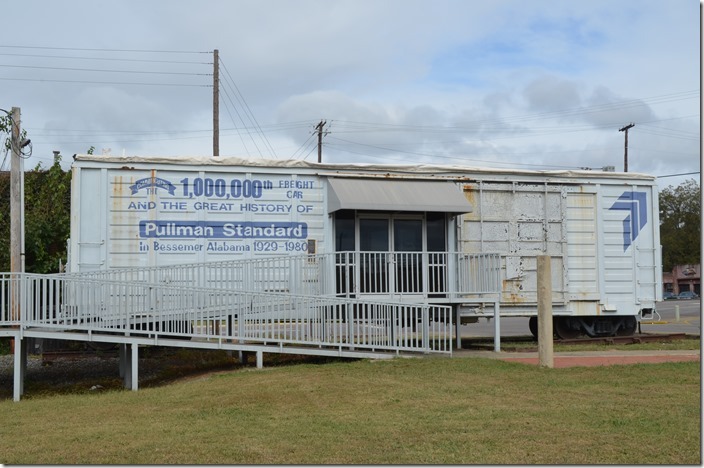 Pullman Standard’s one millionth freight / boxcar car produced at the Bessemer AL plant. P-S sold it to Trinity Industries. It is now closed. Bessemer AL. 9. CSX looking south Bessemer AL. CSX Birmingham Mineral SD looking west toward downtown Bessemer. NS AGS South District double track is on top. Bradshaw Br. (ex-SCL/ACL) switch on right. 10. Looking east on the Birmingham Mineral. 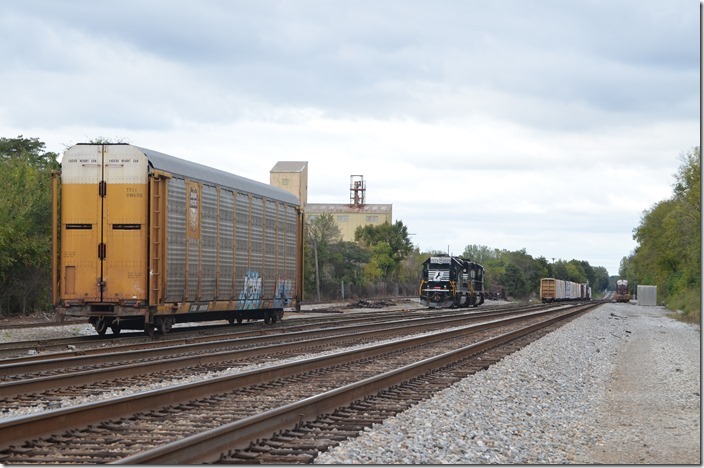 UP 7813-UP 7840 sail south with 27A-03, 37 empty auto racks for the Mercedes plant at Vance AL. 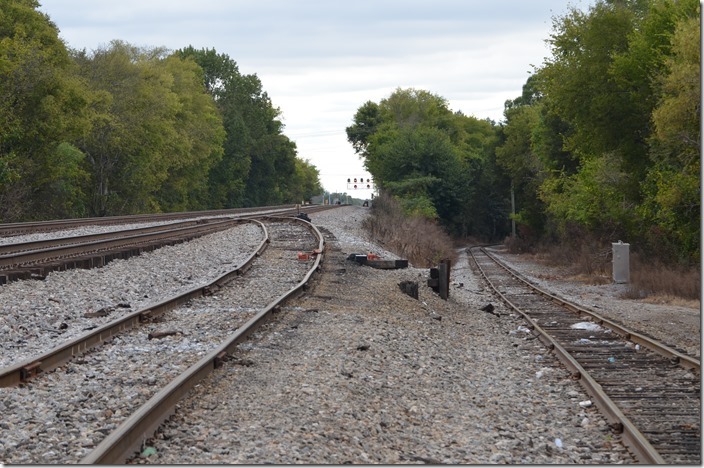 On CSX the location of L&N’s Brickyard Jct. is just around the curve. Nothing much is left there now except a few rails of the long abandoned South Branch that went around the southeast side of Red Mountain. Bessemer AL. 11. CSX crossing NS spur Bessemer AL. It took a lot of research in books, employee timetables, topo maps and Bing, but here goes. 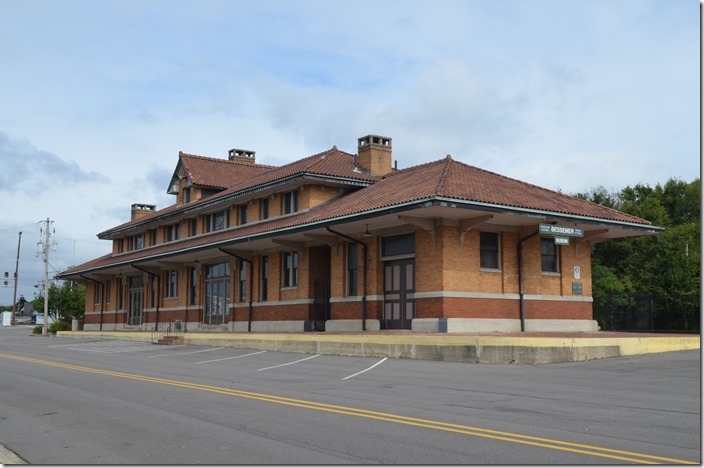 After the old ACL was abandoned coming into Bessemer AL, it was kept intact toward Birmingham to serve local customers. 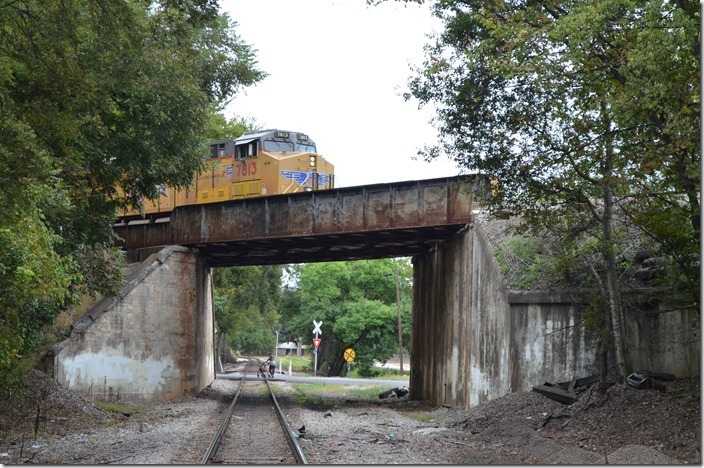 CSX refers it as the Bradshaw Branch which runs about 4 miles northeast and stays fairly close to the AGS. SCL/ACL crossed L&N at grade behind me and used stop boards. The track in the foreground is the Bradshaw Br. just after it switches off the Birmingham Mineral. It heads up a steep grade to a small yard that parallels the AGS yard. The track running diagonally is NS/AGS which paralleled the L&N into downtown Bessemer and on up through Woodward, Fairfield, Ensley, Finley steam loco. shop, and Birmingham. This Southern track also had a spur into the P-S plant. My opinion is that the CSX double-stack train used the Bradshaw Br. 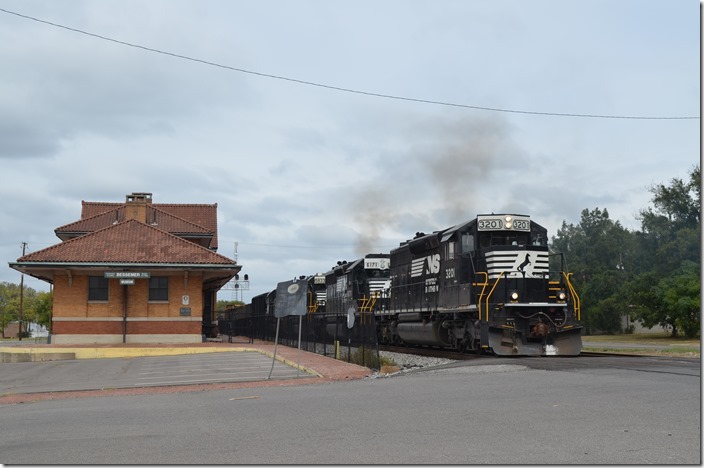 to get up to the P-S plant before backing into the intermodal terminal (privately owned with access both by CSX and NS). 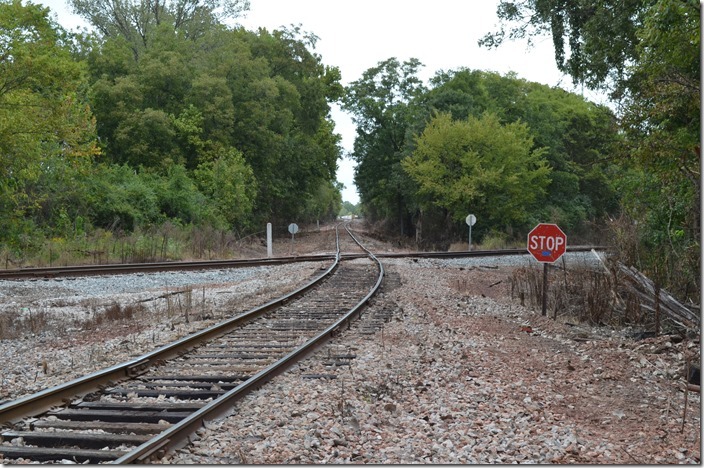 There are more stop signs on railroads in the Birmingham area that on street corners!!! 12. NS Bessemer spur. NS’s line Bessemer spur comes up a steep grade also into their yard. 13. 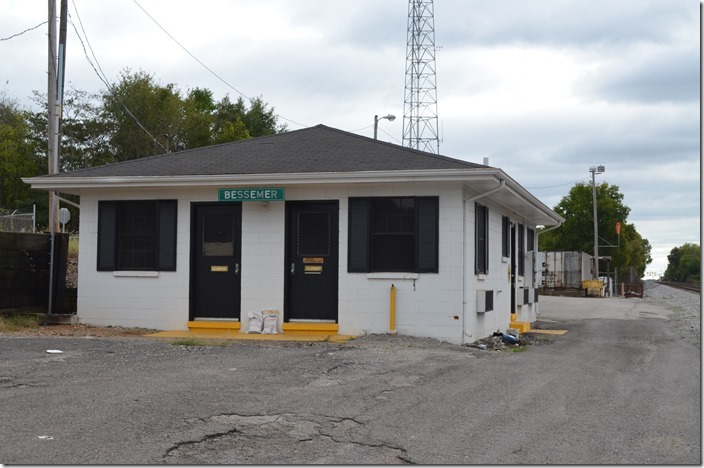 NS yard office at Bessemer AL. Looking north toward Birmingham. 14. 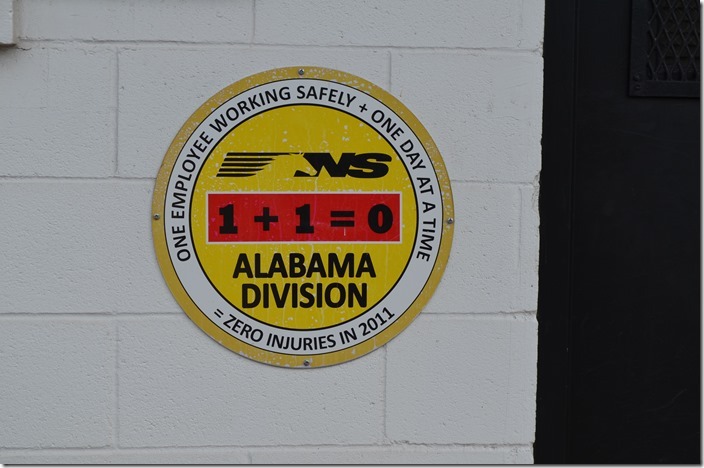 NS yard office Bessemer AL. Placard. 15. 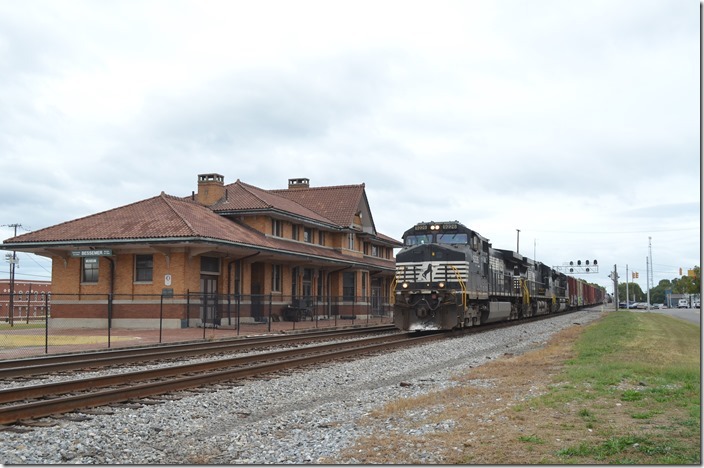 NS yard office Bessemer AL. Looking south toward Meridian. 16. 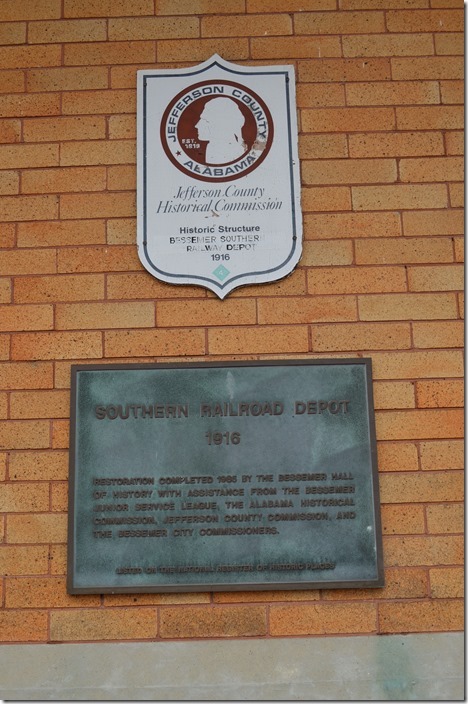 NS 3529-3287 Bessemer AL. SD40-2s 3529-3287 were parked and shut down. The auto racks must be for Mercedes. That may be the CSX Bradshaw Br. on the far left. The large structure may be part of the former P-S plant. 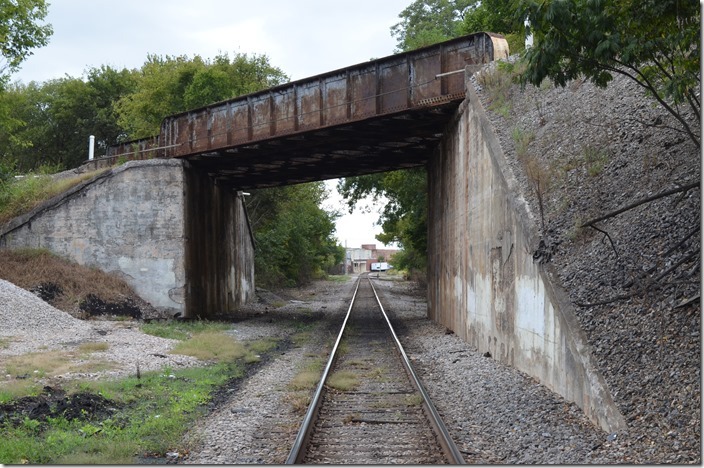 Woodward Iron’s railroad crossed ACL and Sou. on up there somewhere on their way to Red Mountain. I’ve spent the last month researching this stuff. It is only after you have been there that questions are raised. I’ve gotta go back!